Harry Taylor celebrates a goal with Matthew Stokes. Harry Taylor – one of the all-time Geelong greats. Although he’s played mainly as a defender through the years, it was in round 10 during 2012 that Harry had a career best performance. With a small but jubilant crowd of 17,243 at Kardinia Park, Geelong took on Greater Western Sydney in their first AFL campaign. Scores were level at half-time (Harry only had two goals by this point), and the giants were showing off their young talent. The likes of Callan Ward, Jeremy Cameron and Adam Treloar had given head coach Chris Scott plenty to talk to his squad about at the break. 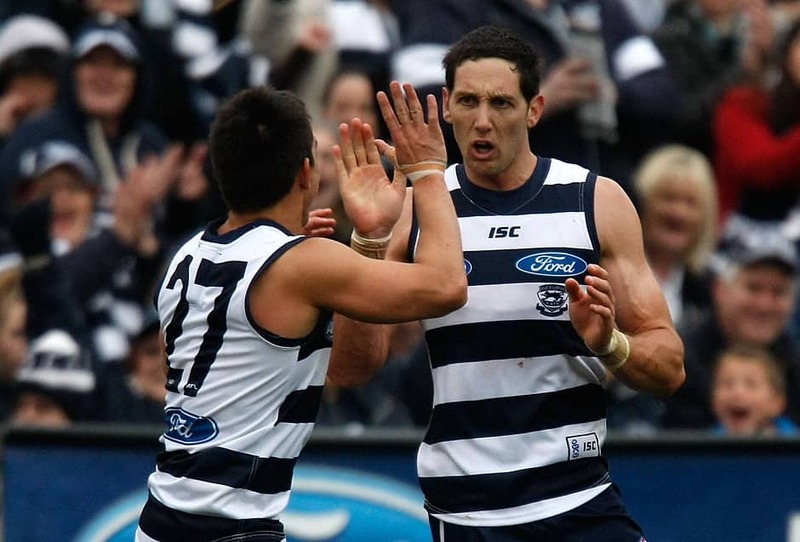 A strong third quarter made it look like Geelong were going to pull away. However, a goal from Shiel within the first minute of the last term put some worry into Cats fans. A three-goal quarter for Taylor helped Geelong trample the giants, in what was a day out for the beloved defender. His career-high six goals was accompanied by a whopping 10 marks, four of which were contested with eight taken inside 50 (another career high). Geelong’s game against the Giants this Saturday afternoon could see Harry kick another bag of snags. His strong form through the early stages of the season suggests he’ll have a prominent role dealing with the talent in the Giants’ forward 50. Although, who wouldn’t love to see him play as a swingman and get on the end of some goals? The match starts at 1:45pm AEST.